Tamilnadu SSLC 2017 Timetable will publish by Directorate of Government Examinations Tamilnadu (DGE Tamilnadu). In 2016 SSLC Examination was started on 15th March 2016 and ended on 13th April 2016. 2017 the exam will conduct from the second week of March to the first week of April 2017. The official notification can view on DGE Tamilnadu Website. As of now DGE, Tamilnadu was announced ESLC - Jan - 2017 - Private Candidates Time Table. The details of the subjects for SSLC Examinations are here. The DGE Tamilnadu is conducting the examination on March/April every year. The duration of the examination is 2 hours 30 minutes. Tamilnadu Board SSLC Timetable 2017 will announce coming December or January. Candidates who are looking for SSLC 2017 Schedule of TN Board must go to the official website. The notification will be on the home page and students can download the date sheet as pdf. 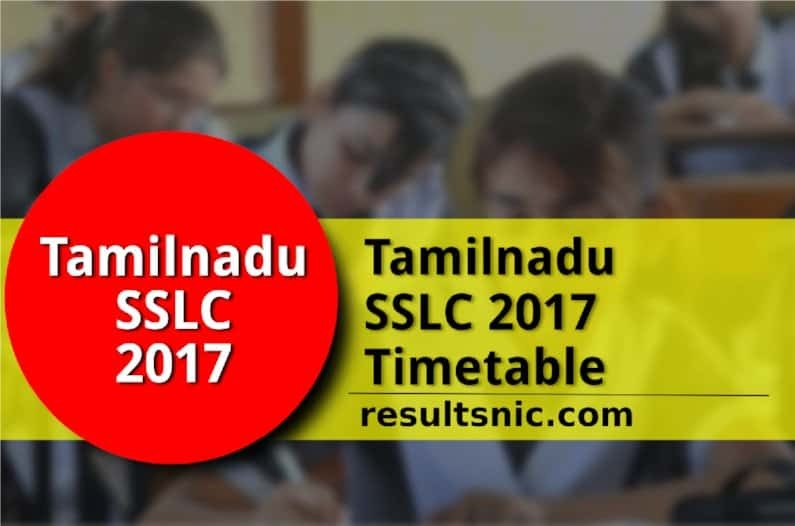 Latest updates regarding the TN Board SSLC 2017 Time Table will available here. The Origination notification about Tamilnadu SSLC is available on the DGE website as PDF. Various details about SSLC 2017 available in that document very detail. School authorities will help students to complete the formalities like applying for SSLC, paying the fee for the examination, submitting the photograph, additional certificates etc. The board notifies all the students by disclosing the exam dates in all leading newspapers in Tamilnadu. All the details regarding Tamil Nadu Chennai Board 10th Time Table for main Exam and supplementary Exam, Admit Card, Result available on official web page. Tamilnadu SSLC time table 2017, Tamilnadu 10th exam time table 2017, 10th public exam time table 2017, SSLC exam timetable 2017 Tamilnadu, 10th public exam paper presentation, 10th public exam time table 2017, 10th SSLC exam timetable, TN board SSLC exam timetable 2016. You actually make it seem so easy with your presentation but I find this topic to be really something which I think I would never understand. It seems very good for me. I’m looking forward for your next post, Ill try to get the hang of it!